I’m so late with April’s statistics that I almost forgot what the month was like. I think it was good though. I’m still keeping up with my New Year Resolutions but I’m one bottle closer to the self-imposed limit. I just couldn’t resist! I liked Jo Malone’s White Lilac & Rhubarb and didn’t want this limited edition bottle to slip away as those limited editions have a habit of doing. I wish I could have all three bottles from this release in 30 ml bottles but for a reason unknown Jo Malone decided to have only 100 ml bottles for this collection. So if anybody wants a small decant of White Lilac & Rhubarb at cost send me an e-mail. This month I decided to check if my reaction to perfumes I test depends on the application method. There is nothing scientific about the results since it wasn’t my choice to spray or to dab: I used whatever sample I had. But based on this anecdotal evidence the application method doesn’t affect whether I like the perfume or not (see the chart). Numbers in parenthesis are comparison to the previous month’s numbers. * Perfumes I tried for the first time and liked a lot (went to my wish list): Indochine by Parfumerie Generale, La Femme Bleue by Giorgio Armani and Dzing! by L’Artisan Parfumeur. Have you found any new favorites recently? 1 For the testing I apply a perfume to one area on my arms easily available for the repetitive sniffing. But, most likely, I’m the only one who can smell it. I can test two, sometimes even more perfumes at the same time. 2 When I wear a perfume I apply it to at least three-four points and usually I plan to spend at least 4-8 hours with the same scent so I’m prepared to re-apply if the original application wears off. This entry was posted in My Stats and tagged Dior, Dzing!, Giorgio Armani, Guerlain, Indochine, Jo Malone, L'Artisan Parfumeur, La Femme Bleue, Parfumerie Generale, perfume statistics, White Lilac & Rhubarb. Bookmark the permalink. I’m finding new favourites all the time. A while ago I got at “Perfumes from the 20-ies”-sampler from TPC. Some of them were technicaly crated before that but in that pack there are several new loves. Mitsuko ( I can’t believe I’ve ever disliked it, but I did when I tried it a year ago), Coty Chypre and Caron Narcisse Noir, mmmmmm. And Dzing! I also find amazing! When you’ve been trying dabbing vs spraying. 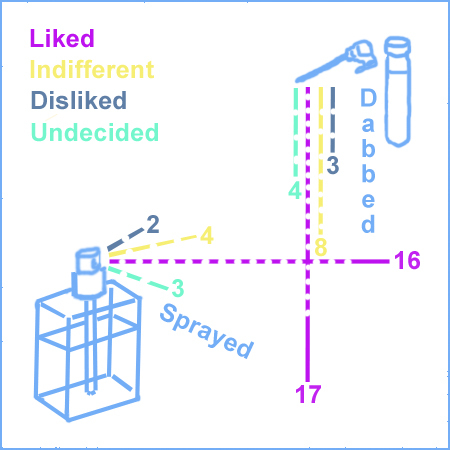 Have you found any guidelines for what perfumes work best dabbed vs. sprayed? Only those perfumes that I don’t like much are better dabbed: I can apply a controlled amount of it very precisely. Other than that I think spraying is better. Haha, that does make sense :) When I first started becoming seriously interested in perfumes I was almost afraid of spray samples as I had no control over how much was applied. Now, I prefer them. Sometimes with dabbing samples I get overcautios and I berate myself smelling so boring all day. I really like that chart you did for dabbing vs spraying. I truly hate dab samples, mostly because I find it difficult to get the little top off of the vials (and to do it without spilling). Also I really do think that spraying helps me smell a perfume better, but by the same token, I don’t think spraying vs dabbing would affect how I feel about the perfume itself. As far as new favorites, as you know, I’m loving the Neela Vermeire samples that arrived to me this week. They absolutely live up to what you and the rest of my favorite bloggers have written of them … I was half afraid they wouldn’t (don’t ask my why) but need not have worried. They’re superb in every regard. I’m so glad you like them! I hope that by the time I finish my small bottle NV will come up with a 30 ml bottle (I heard it was in plans). If a sample isn’t full and was stored in an upright position usually I can open it without spilling. But I agree, spray samples are more convenient. I realized I really like Coty L’Aimant (vintage, from Olenska) – wow! A sample I have smells like a vintage perfume and I’m not sure I want to wear it as a perfume but it was interesting to smell it. Congrats on your new new Jo Malone. Too bad about the size. You’d think a collection would be in small size to entice people to buy the set, but never mind. I’m glad you went for it. I tried L’Air de Rien by Miller Harris on skin today and thought of the great reviews by Suzanne and Lavanya. The drydown is pretty entracing. Exactly! 30 ml bottle of Jo Malone costs $55, 100 ml – $105. I would have paid $165 for 90 ml of three bottles in the collection! But whatever. I read many positive mentions of L’Air de Rien but I haven’t had a chance to try it yet. Tara, L’Air de Rien is one of my top favorites perfumes!!! Glad you tried it today. I will have to explore Miller Harris soon! Somehow I miss this line every time I’m at the only store that carries it in my area. Bois d’Argent is nice but it’s not “my scent”. I think I do not smell some of the notes in there: supposedly it has a lot of sweetness but it must be of the kind that my nose doesn’t register. I dont’ get sweetness from Bois d’Argent, either, Undina. For me, that’s a good thing. It reminds of Iris poudre and or a toned down l’Eau d’hiver. Undina, I just love your graphs. :) One of my recent discoveries was L’Artisan Mimosa pour Moi, as I work my way through the heliotrope and mimosa notes this spring (and moving into summer, because I’m ordering them from 4 different websites due to the smattering of availability.) You’d be impressed by my spreadsheet skillz as I figure out what to order from whom. My main complaint about Mimosa pour Moi was that it disappeared from my skin in less then 2 hours. But my sample was a dab vial so it might be better when sprayed. I finally got to try 100% Love by S-Perfume which I will review soon – it is fantastic! I’m also falling back in love with my Comme Des Garcons EDP 2011, which I crave so much, I will never be without a bottle! I haven’t tried a single perfume out of those you mentioned! :) I will be curious to read your review on 100% Love. Yep I’ll be sure to write up my 100% Love report tomorrow night. As you mentioned Indochine, have you explored much more of the Parfumerie Generale line? Cuir Venenum is a really strange leather, stale cigarette smoke and grape soda – I know I know, these visual cliche descriptives are very amateurish but it’s the best most accurate brief overview I can give. You almost must try my beloved Intrigant Patchouli if you haven’t already, it’s completely not what you expect from the name. And as for the CDG, I also consider it a must try. It grew on me so much as time went on and since I bought my bottle, it flickers onto my all time No.1 spot over and over. I tested five more of Parfumerie Generale’s perfumes, some were nice but none of them felt like “that’s it!”. So I will probably go for a full bottle of Indocine before exploring the rest of the line – just based on a success rate. That’s fair enough, it’s a huge line with lots to explore. Unfortunately I was underwhelmed by Indochine, it was very pleasant, just “not enough” for me. I love the honey note though, creamy and wearable. I hope you do explore some of the greater fragrances in the line compared to those that you obviously haven’t had much success with, they are definitely worth exploring. The only sad thing is – half the line consists of beautiful explosive openings and disappointing drydowns, it’s finding the ones that maintain the beginning. Wow you are organized! Which of the Diors are you finding compelling? I’m curious about it now because I’ve read that some of the re-issues are smelling good, and they’ve been up and down in the past. I like re-issues of Miss Dior, Diorella and Diorissimo. I compared them to the vintage samples I have and they aren’t that different to my nose, so I do not mind wearing them. Other than those, I like and wear New Look 1947, Mitzah and Milly-La-Forêt. Dzing! is a relatively new favorite for me, too! I think that I got my sample 2 months ago or so. I fell instantly for 2 perfumes while at Sniffapalooza, Etat Libre d’Orange Bijou Romantique and L’Artisan Bois Farine. (They’re waving hi from my desk!) It is such an annoyance that those 3 Jo Malones are only being offered in 100 mls. At least the Tea Collection scents are all 30 ml! I haven’t tried either of those two at your desk (say Hi to them as well ;) ) but I heard good things about both. With Tea Collection I wouldn’t mind getting 100 ml of Sweet Milk (because I ended up buying a second 30 ml bottle as a back-up). But if I had to choose just one size, smaller is always better when it comes to perfumes. Yes, it is baffling about those big Jo Malone bottles – I do wish more houses would consider the smaller sizes. I also love La Femme Bleue, which isn’t a recent discovery as such, but my 10ml decant is a recent acquisition with which I am very happy! From the last bottle left in England, apparently, so I moved on it just in time. Hear, hear, on the need for more perfumes in small bottles. I’m a 15 ml -30 ml gal. Three cheers for Jo Malone, Parfums de Nicolaï, Frédéric Malle, Sephora (in general a great selection of 30 ml and travels), and all the others who deliver in smaller doses. I want to add to the list of companies that offer smaller sizes (stand-alone or at least in sets): Atelier Cologne, Estee Lauder (at least some), Hermès (Hermèssence), Histoires de Parfums, Le Labo, Sonoma Scent Studio, Tokyo Milk, Ormonde Jayne, Neela Vermeire Creations, DSH Perfumes and many indie perfumers. If you’re logged in then you need to check your profile: that e-mail address would be coming from there. If you aren’t logged in and see three fields (name, email and web), just change the e-mail once in the form and it’ll remember it the next time if you come from the same computer.